National Pump & Energy has opened the doors of the newest equipment hire branch at Weipa in Far North Queensland. 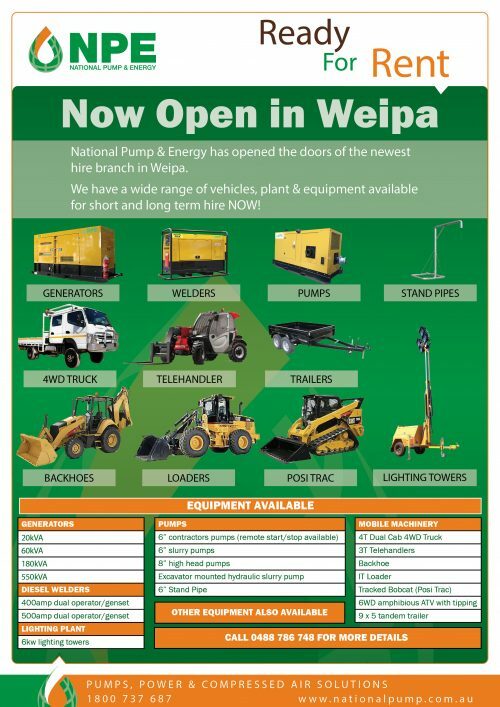 If you are in Weipa or surrounding areas you can now hire a wide range of equipment including pumps, generators, diesel welders, lighting towers and mobile plant. The Weipa hire branch is set to supply many of the local work projects with general and specialist equipment to the mining and heavy industry, civil construction, utilities and agricultural industries of Weipa and Far North Queensland. Further to the dry hire capabilities, NPE can also offer dewatering, hydromining, remote power set-ups, bore pumping and other specialist activities supplied by the experienced NPE team in Weipa. The Weipa hire branch is located at 12 Iraci Crescent and can be contacted by calling 0488 786 748 or 1800 737 687.